CincyWhimsy is starting a new weekend segment: The Snackist. Inspired by my friend who has a knack for whipping up simple, delicious snacks using random ingredients available in any household: Mike Moroski will be penning the articles as a guest contributor, and on occassion, I may share a favorite recipe too. Another bonus: following the recipe, Moroski will be chronicling his thoughts in a chapter series entitled: Foodie & Loathing, a nod to Hunter S. Thompson's book about experiencing the American Dream. Or in this case, the American Dream of snacking. If you try our recipes, be sure to share your photo on the CincyWhimsy Facebook page and tag #TheSnackist on Twitter and Instagram. Do you have ideas for The Snackist? Leave a comment below! Named in honor of a former student at Purcell Marian High School, The Durant was created by a young lady who used to only eat the aforementioned snack for lunch (sometimes she just ate Frank’s Red Hot – even when she had other food. She loved Frank’s). It was only a matter of time before I, too, began eating my Doritos in a similar fashion. I have perfected The Durant and am proud to share it with you – and to spread my student’s legacy to Snackists around the world. 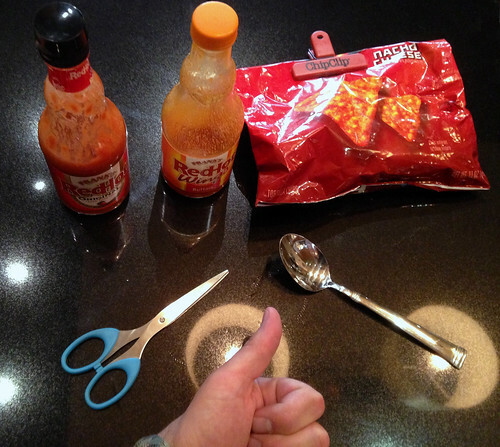 Cut off all of the excess packaging from your Doritos bag. Leave about 3 inches on the bag per 1 inch portion of crumblies. With truncated Doritos bag in one hand, pick up bottle of Frank’s Red Hot in other hand. Pour a liberal (not politically) amount of Frank’s into the truncated bag of Doritos. Thoroughly cover the crumblies until you can no longer see them. Return Frank's Red Hot to the 'fridge. Pinch the bag closed, curl your palms below the bag, and begin to massage the Frank’s into the crumblies so the sauce is thoroughly mixed with the chips. Open bag to make sure the Frank’s Red Hot has been equally distributed. Pick up your spoon in your dominant hand. Use the spoon to eat your Durant. Eat until finished. WARNING: This recipe will tempt you to throw out 75% of your Doritos when you buy a new bag simply so you can create The Durant. Do NOT waste your Doritos. There are starving children in Africa, yes, but also in Cincinnati (50% of our kids are poor). Foodie & Loathing is an homage, perhaps, to my favorite journalist, Hunter S. Thompson, or maybe my reaction to the Dark Side of the Foodie Movement – those Foodies who define self-worth by being able to afford to eat out all the time and write about it. I’m not sure; it’s one of the two. Until next time, snack well, snack often, and snack creatively.